Professor Kurt Brokaw has taught advertising courses at The New School for 32 consecutive years. He's senior film critic of The Independent and has taught film and literature courses at the 92nd Street Y for the past 14 years. He was an original "Mad Man" starting in 1961, and has been a copywriter and creative supervisor at three top-ten New York ad agencies as well as creative director at RCA Records. Kurt holds M.S.and B.S. degrees from The University of Wisconsin, and authored the trade bestseller, "A Night In Transylvania: The Dracula Scrapbook," a cross-cultural history of Dracula. Tell us how you became interested in the Dracula legend. Horror movies were a genre passion since writing for my Indianapolis high school newspaper 1952-56, and becoming the film reviewer for the U of Wisconsin student newspaper 56-61. My undergrad/grad majors were in advertising, and I migrated to Madison Avenue as a “Mad Man” for 30 years. One high spot was developing a television commercial for Vanish (bathroom cleaner) with master magician Harry Blackstone, Jr. 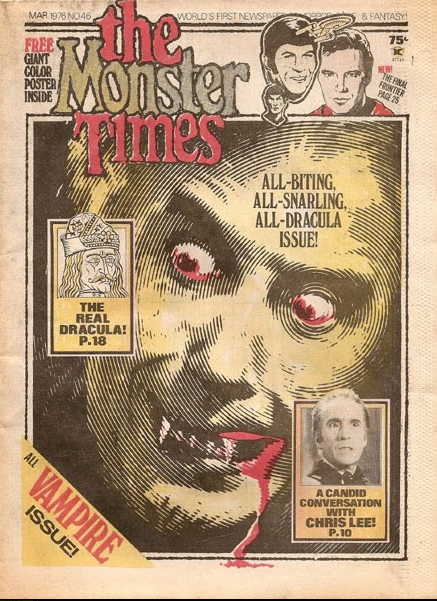 In ’75 I was on assignment for The Monster Times, a well-remembered fanzine in Manhattan, researching a long Transylvania travelog and Vlad Dracul history, and photographing all the key sites. Later that year, I was curating and hosting a film series in Scarsdale (north of Manhattan) called Preacher Features, with local ministers, priests and rabbis giving their take on art films. On impulse I decided to try a slide show with music plus a screening of “Horror of Dracula.” And instead of inviting a local clergy person, I invited Radu Florescu, the mainstream Dracula scholar along with Raymond McNally, to come down from Boston. To my astonishment he accepted, the local paper gave it a big play, and we sold out a huge community hall. An editor from Grosset & Dunlap publishers was there, and tasked me to expand The Monster times travelog into a book-length exploration of the historical figure, plus Bram Stoker’s fictional legend and all nine yards of popular culture. 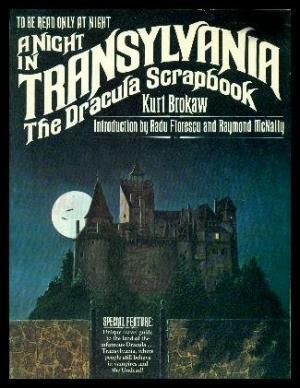 That became “A Night in Transylvania: The Dracula Scrapbook,” launched in ’76 on the 500th anniversary of Vlad’s death, with an intro by Florescu and McNally. 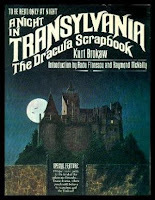 Their support plus friendships with Jeanne Youngson who ran The Count Dracula Society and The Vampire Empire in New York City, and Elizabeth Wilson, an eminent Dracula scholar based at the University of Newfoundland, helped the book enjoy healthy runs in hardcover and trade paper. How much research on Dracula did you do before going to Transylvania? The key texts were Florescu and McNally’s “In Search of Dracula” and their “Dracula: A Biography of Vlad the Impaler 1531-76.” A favorite film book was and is Lotte Eisner’s “The Haunted Screen” on early German cinema. And because I partly worked my way through college and early parenthood as a magician at children’s birthday parties, I studied The Vampire Block routines, a classic magic illusion that can entertain all ages. I’ve also watched automatons perform in the Robert Houdin museum in Paris as well as in Ricky Jay’s superb stage performances, and while these mechanical moving dolls aren’t vampires, they’re a kind of special Undead. What is your favorite Dracula movie? Hammer’s “Horror of Dracula” is the one I’ll revisit most often. “Abbott and Costello Meet Frankenstein” with Lugosi reprising Dracula turns up when my three grown daughters and son are visiting. (Even my wife will watch that one.) Werner Herzog’s “Nosferatu” with the inimitable Klaus Kinski still stays with me. My #1 contemporary vampire film remains Kathryn Bigelow’s “Near Dark” which my son initially recommended. Name some of your other favorite horror films. I reviewed “The Babadook” as senior film critic for The Independent (Independent-magazine.org) quite highly. Ti West’s “House of the Devil” has a teenage-girl-trapped-in-haunted-house sensibility that’s timeless. My Hammer favorites next to “Horror of Dracula” and “Brides of Dracula” are “Hound of the Baskervilles” with Cushing/Lee, and especially “Dr. Jekyll and Sister Hyde,” with Martine Beswick’s scream queen performance matching young Ralph Bates, who might have grown into another Cushing. “The Mad Magician” with Vincent Price in 3-D was a favorite magic horror. And Julie Adams’ 3-D lake swim in “Creature from the Black Lagoon” still gets my pulse racing. Why do you think horror films remain popular? Having unsuccessfully pushing around proposals for similar travel “Nights” books on Frankenstein and The Mummy, I’ve come to believe Dracula films combining sexuality with eternal life will always reign. Frankenstein is a bucket of bolts, and The Mummy is this entombed dusty geezer. But when Frank Langella played Dracula on Broadway against Edward Gorey’s super-stylized black-and-white set, and then mounted this poor trembling gal, opening his shirt and ripping a trail from his neck on down with a sharp fingernail, releasing little rivulets of bright red blood down his handsome bare chest, the audience actually gasped. It was as close to the Grand Guignol as Broadway’s ever gotten. Also, Anthony Hopkins told me late one winter night after I’d watched him shoot an outdoor scene locally in bitter cold, and then invited me into his trailer for tea, that he could play Hannibal Lector more than once without endangering his career. This wasn’t always the case with actors, as Tony Perkins discovered doing the “Psycho” cycle. The late Don Westlake told my “Pulp Fiction” college class that his 1987 screenplay of “The Stepfather,” a serial killer outing, had big trouble casting the psychopathic lead (finally played by a fine Terry O’Quinn). As I’m closing in on 80, I’ve found careers (teaching at The New School and 92nd Street Y, reviewing for The Independent, and collecting/selling 40s paperbacks and 30s/40s pulp magazines through much of my life) that jell. In these pursuits, age has never worked against me, and as I go from “old” to “ancient,” people assume there’s maturity, mystery and wisdom at work. It’s all misdirection and smoke-and-mirrors, but it’s helping keep me young even when everything but my head aches in the morning. Please in your own words write a paragraph about yourself and your work. I’ll turn it around a bit: Your interview with my nephew magician and inventor-builder of magic illusions Michael Baker is touching and satisfying. It was my pleasure to introduce young Michael to magic, "most of my beautifully airbrushed equipment was acquired in the early 1950s" and he made magic first his passion and then his lifelong career. I sit at his feet now and consider myself his student, so we’ve come full circle.